UCSC researchers coaxed mouse embryonic stem cells growing in culture to differentiate into these neurons. Image by A. Love. The California Institute for Regenerative Medicine (CIRM) has approved a $7.2 million grant to fund a new stem cell research center at the University of California, Santa Cruz. The center will house an interdisciplinary program involving faculty from five departments at UCSC and collaborators at other institutions. "We're delighted at this latest in an ongoing line of successes in obtaining funding for cutting-edge biomedical research at UCSC," said Bruce Margon, vice chancellor for research. "For an institution that has no medical school, but does have a history of high-quality biomedical work, major grants such as this one are wonderful affirmations of the quality of our faculty." The new grant was among $271 million in major facilities grants approved by the CIRM governing board on May 7 to fund new stem cell research facilities at 12 institutions. UCSC has now received a total of more than $16 million from CIRM in funding for new facilities and grants for individual researchers. The UCSC stem cell program brings together a diverse group of researchers with expertise in areas ranging from genetics and neurobiology to bioinformatics and new engineering technologies. 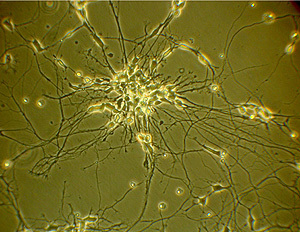 Their research focuses on basic stem cell biology and the development of new techniques for studying and using stem cells. These studies have potential clinical applications for treating conditions such as neurodegenerative diseases, spinal cord injuries, stroke, and certain heart diseases and cancers. "It's not just our faculty and their students who will benefit from this funding--these resources will allow innovative attacks on some of the most serious diseases that impact our citizens," Margon said. The research program involves faculty and students from two departments in the Baskin School of Engineering and three departments in the Division of Physical and Biological Sciences. The program builds on UCSC's existing strengths in several specialized areas that have great promise for advancing the field of stem cell research, said Stephen Thorsett, dean of physical and biological sciences. "I am very excited about our unique interdisciplinary approach to stem cell research at UCSC, which the scientific reviewers at CIRM said was 'outstanding' and 'vibrant,'" Thorsett said. "They noted that our work in bioinformatics and genomics is a core strength not just for California, but internationally, and they were intrigued by the way we will bring astronomers, biologists, and engineers together to develop the next generation of microscopes for stem cell work. This new grant will allow us to continue to build exceptional research and training programs at UCSC in a field with fundamental importance to our understanding of human health and disease." The new center will include laboratory space for six UCSC faculty involved in stem cell research and will support a much larger number of scientists by providing a core area with laboratory instruments required for their research, such as microscopy and tissue culture rooms. The additional lab space will also allow the campus to hire new faculty members interested in pursuing stem cell research and will support additional research by undergraduate and graduate students. "This funding is a big step forward in helping us attract more bright, young researchers, and it allows us to significantly ramp up our efforts in stem cell engineering," said Michael Isaacson, acting dean of the Baskin School of Engineering. The new facilities, which will occupy the fourth floor of the planned Biomedical Sciences Building, will more than double the amount of laboratory space dedicated to stem cell research at UCSC. "We envision this facility serving as a hub for stem cell research on campus," said Ann Pace, associate director of UCSC's Center for Biomolecular Science and Engineering. A $2.7 million CIRM grant in June 2007 funded a Shared Stem Cell Facility in the nearby Sinsheimer Laboratories Building, which provides cell culture rooms and other core facilities for stem cell research and training. Due to federal policies restricting the stem cell lines that can be studied in federally funded labs, the CIRM-funded facilities are the only sites where UCSC researchers can use the full range of human embryonic stem cell lines.
. UCSC bioinformatics experts plan to create a web-based interactive browser that will integrate genomic data from stem cell research and make it available to all CIRM-funded labs in California.
. Astronomers with expertise in adaptive optics for telescopes will be working with electrical engineers and biologists on new deep-tissue imaging techniques.
. Neurobiologists will study the remodeling of the nervous system that occurs after a stroke and test the ability of stem cell transplants to improve this process.
. Developmental biologists and geneticists will use stem cells to study the genes expressed during brain development, with the aim of shedding light on neurodevelopmental diseases. CIRM was established in early 2005 after the passage in 2004 of Proposition 71, the California Stem Cell Research and Cures Act. The CIRM governing board has now approved research and facility grants totaling more than $530 million, making CIRM the largest source of funding for human embryonic stem cell research in the world. More information is available on the CIRM web site.